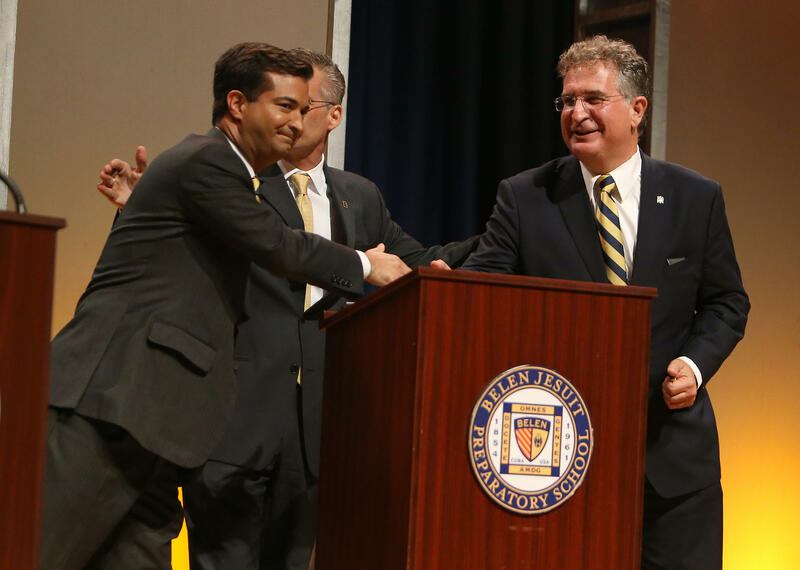 Belen alumni Carlos Curbelo and Joe Garcia return to their alma mater for the first debate of three that will take place before the Nov. 8 election. Carlos Curbelo said he will not vote for Donald Trump nor Hillary Clinton. 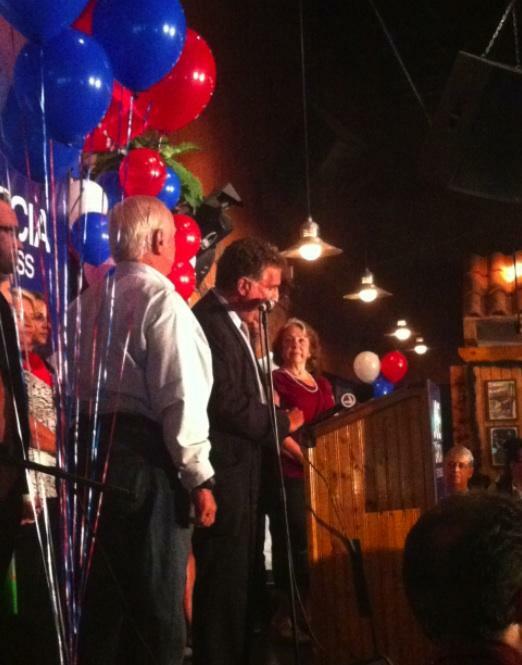 Joe Garcia rejected the idea of taking away all benefits for Cuban refugees. Students at Belen Jesuit asked the candidates questions on a variety of topics: from Cuba to the cost of higher education. Republican Carlos Curbelo and Democrat Joe Garcia showed on Thursday evening why the race to represent the southernmost congressional district is one of the most closely watched in the country. The two candidates competing - again in Congressional District 26 met for a debate at their alma mater, Belen Jesuit, in western Miami-Dade County. Garcia and Curbelo faced each other two years ago. Curbelo won by three percentage points. 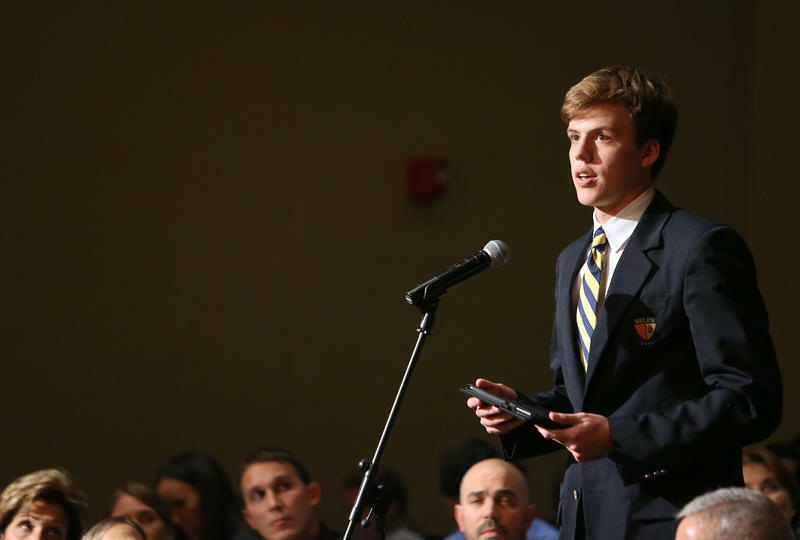 Students of the all-boys preparatory school were in attendance and asked the questions presented to the candidates with topics ranging from immigration reform to the fight against poverty and the cost of high education. The debate was moderated by a third alumnus, Tom Llamas, Sunday anchor for ABC World News Tonight. Echoes of the national campaign were felt from the beginning of the debate when both candidates were asked if they support their party's presidential candidate. Curbelo repeated his previous stance that he would not vote for fellow Republican Donald Trump, but said he wasn't voting for Hillary Clinton either. 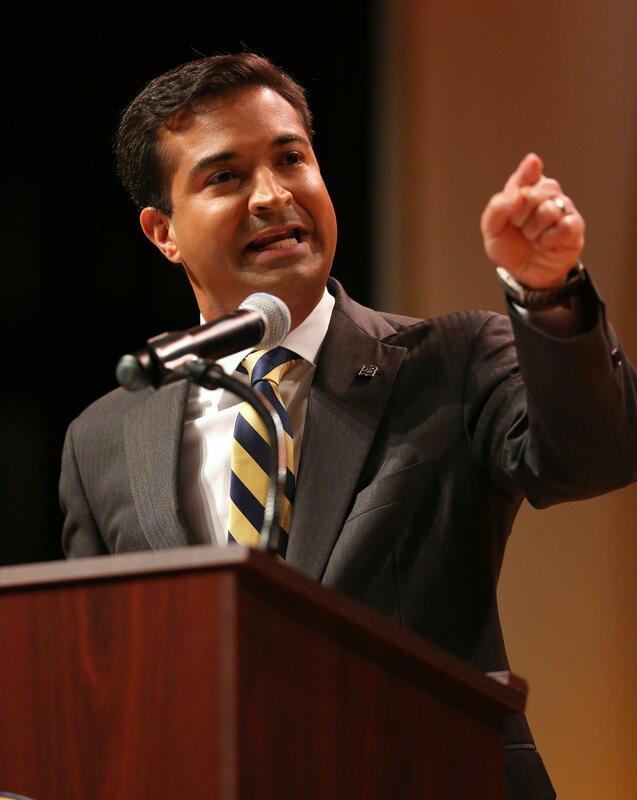 “The only wasted vote in an election is a vote cast for someone who you do not believe in,” said Curbelo. Despite the few mentions of agreement, there were sharply different views on most issues, including the Obama administration’s new direction of U.S. policy toward Cuba. Curbelo is against lifting the embargo. “No, this policy does not advance U.S. national security. At the very least the president should have gotten some concessions. The president gave everything and the United States has gotten nothing,” said Curbelo. Garcia supports lifting the embargo. “The absurdity of this debate, the playing with emotions is precisely why this is wrong. Two weeks ago a raft showed up on our shores with dead people in it. Mr. Curbelo’s press release blamed the Obama administration, in fact, blamed President Obama’s failed policy. There have been people trying to escape Cuba for half a century. Now we’re trying to bring change,” said Garcia. Curbelo had to answer questions about whether he supported Donald Trump's proposal to build a wall in the U.S.-Mexico border. Both candidates reiterated their support for immigration reform, although they differed on the issue of executive action.
.@joegarcia defends IV-5 prog (for foreign investors) & work visas. "When I was in Congress we wanted to raise the fees to create more jobs"
Curbelo and Garcia have contrasting positions on automatically granting political refugee status to all Cubans who arrive in the United States, as they expressed in a segment of the debate conducted totally in Spanish. 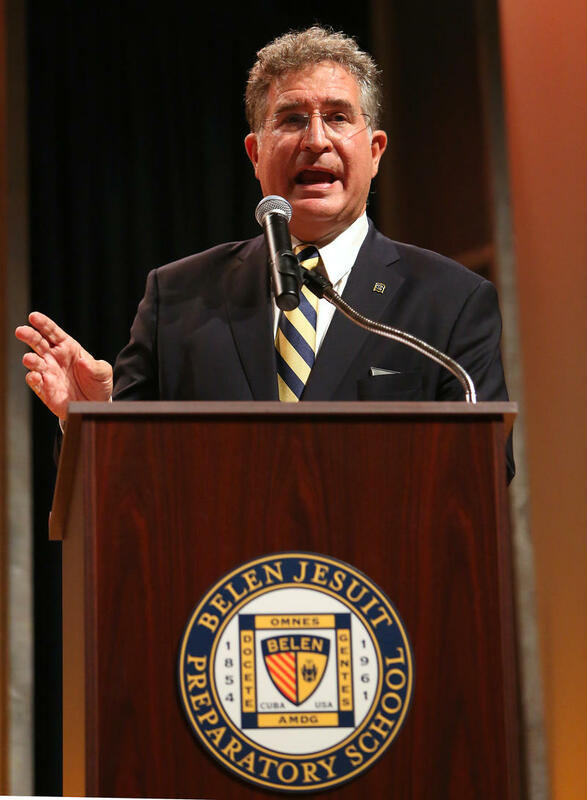 "Está bien q cubanos vengan a trabajar, pero es un abuso de las leyes de este país," dice @RepCurbelo "Hay que arreglarlo"
The exchanges between Curbelo and Garcia kept the close to 200 Belen Jesuit students in attendance transfixed during 90 minutes. Very few things broke the spell, like the moment when the moderator reminded the candidates that the school's principal still could issue detention passes for both if they kept on interrupting each other. "It was my first political event of this type. When I saw them [the candidates] come onto the stage I was a little in shock, like they were some celebrities," said senior Jorge Miro-Quesada. When asked if being at the debate changed their minds about the issues or gave them new perspectives, Miro-Quesada said that he was intrigued by "the notion of using criminal justice reform to fight poverty. Curbelo made me think about that." For Romero, the main takeaway was "the importance of crossing the aisle, of working in a bipartisan way." Garcia and Curbelo will debate again on Oct. 17 in a forum in Key West, and in Nov. 1 in an all-Spanish debate organized by local channel América Tevé. The 26th Congressional District stretches from south Miami-Dade County to Key West. Miami-Dade school board member Carlos Curbelo surfed a national Republican wave to victory over Democrat Joe Garcia in Florida's 26th congressional district. The state’s southernmost district includes both suburban Kendall and eclectic Key West. 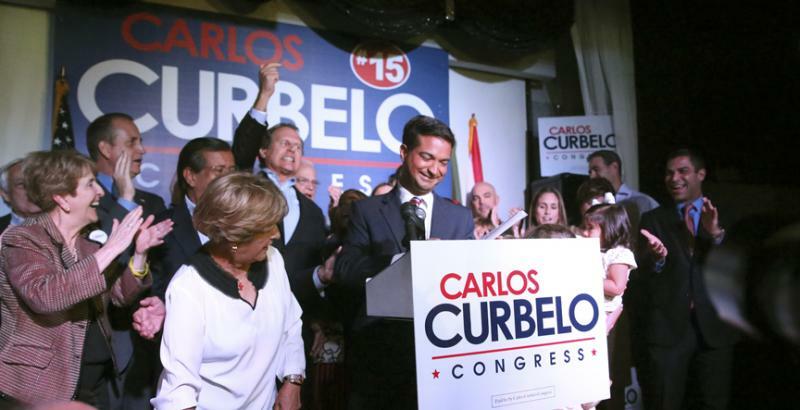 Garcia won the seat two years ago, but Curbelo has returned it to Republican control. Curbelo says voters are frustrated and disillusioned with government. Democrat Joe Garcia convincingly beat incumbent Republican David Rivera Tuesday night to win Florida's 26th Congressional District seat. 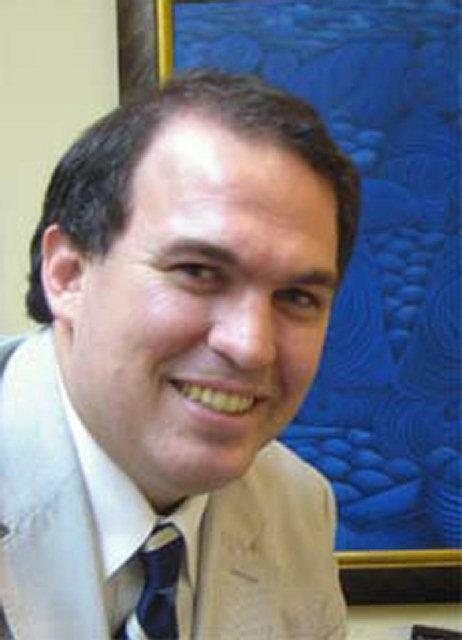 Rivera lost by more than 10 points to Garcia. It was almost a perfect reversal from 2010, when Rivera soundly beat Garcia by more than 9 points. After two failed runs for U.S. Congress, Garcia got some unconventional help this time around. His opponent, incumbent David Rivera, was the target of two federal investigations and was accused of ethics violations by the state ethics commission.